2009-08-02 by @edent | #camera #security | 2 comments | Read ~172 times. Monitoring your home or business used to mean having an array of unsightly camera feeding grainy, washed out pictures into a row of VHS machines. In recent years we've seen the move to digital pictures, infra-red beams for night vision and, most recently, viewing over the Internet. What's the next logical step? Viewing on your mobile, of course! Two British companies have come up with some innovative - and cheap - technologies to make watching over your home as simple as picking up your phone. 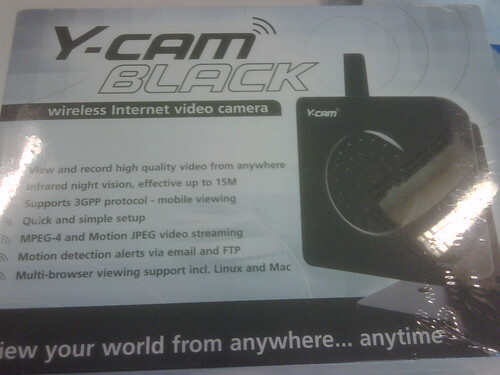 Y-Cam is an Internet camera which looks like any other. It works via ethernet or WiFi. A full compliment of acronyms and tech spec including, DDNS, NTP, user management, ftp, email. It's got a decent VGA resolution. It has Infra-red for the all important night vision. In short, it's got everything you'd expect from a standard IP camera. But the Y-Cam has three little secrets. The first is that you don't need to be chained to your PC to watch what's going on at home. The Y-Cam has an inbuilt RTSP server - so you can stream live video and audio directly to your handset! If you've only got a 2.5G phone - that's no problem, you can set the bandwidth to a level that's suitable for your device. Y-Cam have recently updated the device's firmware to include BlackBerry support. If you want a demo of the quality, visit Y-Cam's live gallery. The second secret is that it will email you photos when it detects motion. Because you can choose the size of the emailed photo, it's perfect for receiving on your phone. Here's a snap sent to my BlackBerry. But, saving the best for last, Y-Cam works flawlessly with Linux. And Mac, if you're in to that sort of thing. Everything from set-up, configuration and viewing works as well in FireFox as it does in IE. The only thing it won't do is set up specific motion detection zones - that uses Active-X so can only be done with Internet Explorer. A minor blemish. The Y-Cam costs around £150. Bargain! The second is small British start-up Peepr. Done. And it won't cost you a penny. Peepr will even attempt to SMS you if it detects motion. Of course, it's a lot less fully featured than the Y-Cam, but its power is in its simplicity. If you've got a PC or laptop and a £9.99 webcam, you can have an instant view of your home whether you're sat in the office, pub or train. So, two pretty smart and simple ways to watch over your stuff from your phone. If I remember rightly, there was a guy at the last MGoL who had written his own version of this kind of stuff for his N95.